Former foreign secretary Boris Johnson sets out what he sees as the "many defects" in the prime minister's Brexit deal in the Daily Telegraph. 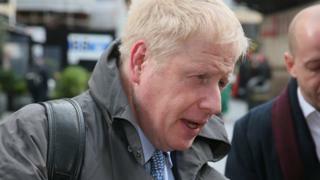 He believes that if Parliament backs the deal this week the UK will enter the second phase of the talks in "a position of almost unbearable weakness" with "every single important issue" up for negotiation. He is hoping Britain will win concessions at the EU summit on Thursday. The Sun fears "Brexit is in peril" after Labour said it would back an amendment that would ensure there was a referendum if Theresa May's deal was passed by MPs. It calls such an amendment "an establishment stitch-up" with serious consequences for democracy. The Guardian's Matthew d'Ancona is hoping for a long delay to Brexit to give more time to consider all the options before putting the "least worst" to the people in a referendum. In the Daily Mail, the former Conservative Chancellor Lord Lamont announces his conversion to the deal. He says it's far from ideal but has one overwhelming advantage - we will definitely leave. "This opportunity will never happen again," he writes. The New Zealand Herald says many gun owners have been voluntarily handing in semi-automatic weapons following the Christchurch attack and the promise of new gun laws. One farmer says he used his rifle for pest control - but that his convenience doesn't outweigh the risk that it could be misused. He has handed in his weapon at his local police station. Women could be forced to wait months for smear test results, according to the Daily Mail, because of plans to close dozens of laboratories. The paper says the number of labs is being reduced from 50 to nine - despite a government campaign encouraging women to have the tests which check for signs of cancer. The British Association of Cytopathology tells the paper the service is "in meltdown". A new form of pension plan is coming to Britain. The Daily Express says workers at Royal Mail will be the first in the UK to be able to join what's known as a Collective Defined Contribution Scheme. Such pensions are popular in Denmark and the Netherlands, and allow staff to share some of the risks of investing by keeping their money in a joint fund. Work and Pensions Secretary Amber Rudd says she will "keep a close eye" on the scheme before deciding whether to allow more firms to join. Finally, concern about drunken airline passengers who have been involved in fights has led to what amounts to a ban on duty-free alcohol being drunk during flights, according to the Times. The paper says new rules require all duty free to be sold in sealed bags, which are impossible to open without scissors or a knife - both of which are banned in hand luggage. The scheme has been introduced by World Duty Free, which runs shops at most large airports in Britain. The paper says some airports - including Gatwick - have gone further by banning sales of miniature bottles from duty-free shops and introducing a "no shots" policy in bars.